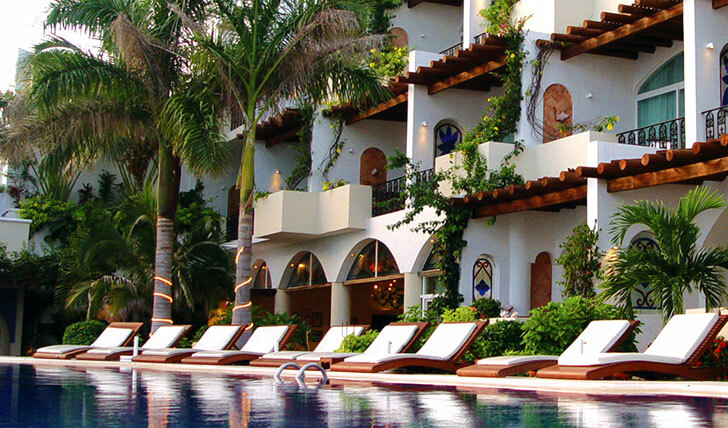 Villa Rolandi is the coveted Isla Mujeres small luxury beachfront hotel. The hotel features a gourmet restaurant; Casa Rolandi, popular with the locals and a brilliant 5-star spa offering unique therapies. Rolandi also boasts a stunning private beach and two outdoor pools; one with a waterfall and patio; a fitness center and sauna. The hotel also has its own private yacht and dock for exclusive use by residents. Villa Rolandi is a mere 5 minutes from the ferry terminal in Isla Mujeres and only 20 minutes from the mainland. The hotel lies between the turquoise Caribbean Sea and the Lagoon Makax making the surrounding views especially spectacular. The hotel features a total of 35 beautiful ocean view suites in 3 different categories; Junior Suites, Master Suites and one Presidential Suite. The rooms are decorated in a modern style with the finest linens, soft neutral colors and beautiful finishings in Italian marble. The spa-like bathrooms feature dual therapeutic showers and a steam bath. From your private terrace you can stare out over the stunning Caribbean Sea or go for a dip in the outside jacuzzi. A truly beautiful property in an unforgettable location, it is the perfect place to relax and an even better base for exploring your exceptional surroundings.